As I have been doing more coaching over the last year, I have been seeing how some people tend to employ magical thinking. They believe that if they just think of what they want, then somehow it will magically happen. This is influenced by books like The Secret, which tout that visualizing what you want will make it happen, and by movies where everything falls into place for the protagonist. And sometimes the universe aligns and good things happen without you having to do anything (and we all remember those times). But more often, the universe needs some help to enable a desired result to happen. The human brain is a pattern-recognition machine that has been trained to see the world a certain way based on your life experience. As I wrote in that post, “we often see what we expect to see. Our entire sensory system is designed around the principle that it should adapt its interpretation of raw sensory data to match [what it thinks] it should be seeing.” So our brains will filter out things that don’t match what we expect based on our experience. This filtering means that seeing new options requires doing new things, so as to re-train the brain to interpret what it receives differently. Changing our behavior will have the impact of changing our brain and how we see the world; we will literally see new possibilities. I talked about this in the doubt tax post, but an example is that when I first started big climbs on my bike, I interpreted the pain and tiredness I felt as a sign that I couldn’t do it and I should stop and turn around. Once I had finished the climbs a couple times, I realized that those sensations were part of the process and I could just keep going. My brain is now wired to respond to the world differently on those bike rides. Part of what I like about the Integral Coaching methodology is that it applies this idea to helping people change their behavior. If a coach can help encourage a person to try some small steps in a new direction, they can start to re-wire their brain. As their actions create new possibilities, they can break out of their stuckness to find their way to a new (hopefully better) place. But this relies on people being willing to try something new. Change is scary. People tend to cling to what they know, even if they are unhappy, saying “I can’t do that – it’s just not how I’m built”. They are choosing their current identity over the possibility of doing something new. It feels safer to do that than to challenge a deeply held assumption about themselves that is keeping them where they are. They would have to push through the discomfort of doing something unfamiliar, and the outcome is uncertain; it might be better, but it might be worse, so it’s safer to stay with the situation that they know. To make this more concrete, imagine that I consider myself an introvert and socially awkward. I’d choose to sit at home each night writing blog posts instead of going out to meet new people. I’d look forward to weekends where I can lock myself in my apartment and not see anybody for 2 whole days. I’d imagine going out as being painful, and then if I do actually go out, I’d experience any little setback as being painful and a confirmation of my awkwardness. Any negative social interaction would be also be seen as a reflection on me. It’s a closed loop, where my identity colors my interpretation of events which affects my actions which reinforce my identity. And yet, what if I decided to flip my default one year, and decide to say yes to new possibilities? After doing so, I start to see that my awkwardness was not destined by my identity, but merely the normal awkwardness when learning something new. As I start to develop those social skills I had ignored for most of my life, I start to realize that I actually like going out with people. Setbacks shift from identity confirmation to opportunities to learn new social skills. And after a few years of my new behavior, I start to see myself as a social hub who organizes large social events like Overlap, rather than a hopeless awkward introvert. Having experienced this sort of shift in my own life makes me believe it’s possible for all of us. Trying new things shifted how I interpreted what happened in the world which enabled me to find a new identity for myself. But it started with me believing that change was possible (my identity as an introvert wasn’t destiny), and me being unhappy enough to decide I wanted to try some new things that I had previously rejected without trying. 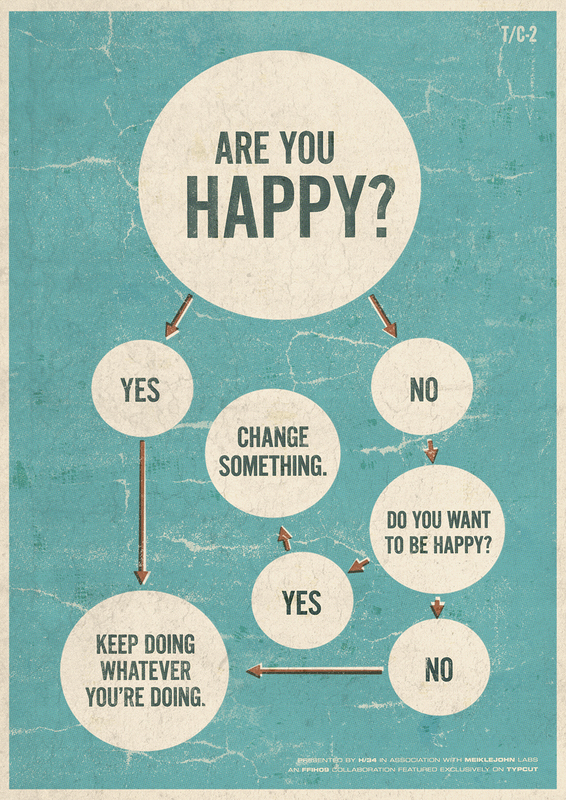 I love the flowchart to the right as a reminder of how to find one’s way to happiness – if you’re unhappy, change something. If you’re not sure what to change, try some experiments to help find your way. If you’re particularly stuck, ask for help from friends or a coach. One other aspect of Integral Coaching that I like is that it builds from the premise that our behavior is a function of what we think, the habits we’ve built in our body, our relationships and culture, and our physical environment. So if we want to change our behavior, it helps to make adjustments across all of those four domains – it’s not enough to simply think “I want to change what I do” (this is why New Year’s resolutions often fail). It requires building new habits (I’m a fan of BJ Fogg’s tiny habits), using our friends to help reinforce those habits (e.g. committing to a friend to run together or write together), and re-designing our physical environment to make that behavior easy (e.g. packing the gym bag before going to sleep, so it’s easy to grab it and head to the gym in the morning). If we think about how to change our behavior across these four domains, it makes the shift happen faster. If you feel stuck, and unhappy with how your life is going, I implore you to consider trying something different. There may be reasons why you can’t change (e.g. you need the job to pay the rent) but can you start experimenting with what a change might look like? Can you volunteer with an interesting group or interview somebody who has a job you like? There are a lot of possibilities in the world, and if you devote even one hour a week to exploring those possibilities, you might start figuring out a path towards change. And if you’d like to brainstorm on such possibilities, I’m always happy to chat.